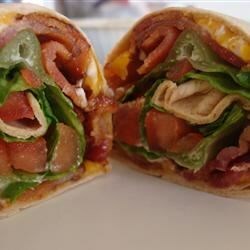 "I love wraps, but am allergic to mayonnaise, so I designed this wrap to be glued together with melted cheese instead." A good variation is to substitute taco meat and grilled onions for the bacon. Although not bad "dry", I like to drizzle some ranch dressing overall. Tasty and make a good, quick and healthy lunch. My dad doesn't like things to be at all dry. Everything must have some sort of sauce on it, so he put 1000 island dressing on it and it was really good! !